Greetings and salutations from all of us here on the Seattle field crew. Like you, we have also noticed that glowing, round object in the sky, which must mean that it’s Spring. 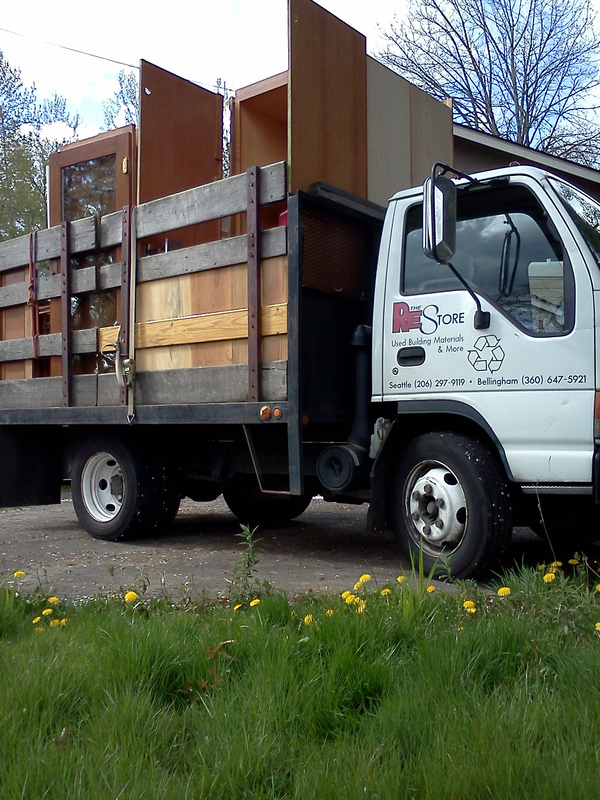 This time of year brings more Salvage Service jobs and more hours spent crammed in the cab of The RE Store trucks. From the islands to the highlands, and places beyond, we cover a lot of ground to recover all sorts of materials around Puget Sound. 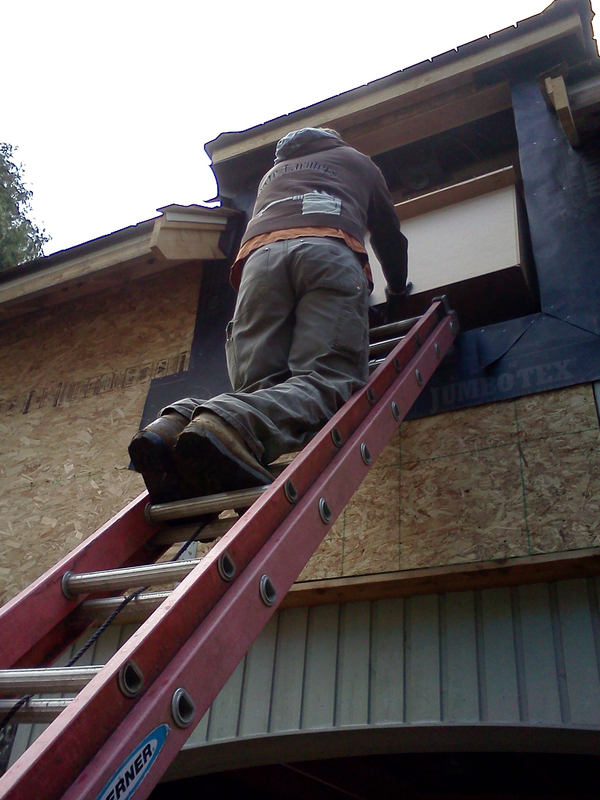 Just last week, we found ourselves in scenic Fall City for an aerial entertainment center removal, in Carnation for a pre-demolition house salvage, and ending with a pick up in Duvall. Good things really do come from high places – when they are pulled from second story windows and shimmied down ladders (safely, of course). What am I talking about? Why, removing a three piece, built-in, cherry entertainment center from the second floor of a house. The only practical way to remove this oversized item was through the master bedroom window. We never said that salvaging reusable materials was easy. Believe it or not, the process went very quickly. Thank you gravity! After our aerialist act with ladders, heavy cabinetry, and physics, we headed over to Carnation for a more conventional salvage operation at a King County-owned property. This particular home was being razed to restore the adjacent river. Our licensed and bonded salvage crews regularly collaborate on green projects with both the city of Seattle and King County. These ongoing efforts reduce government waste disposal costs and provide a steady stream of reusable materials for shoppers in our two stores in Ballard and Bellingham. Before the County’s demolition work began, we were allowed to salvage out a truck load of reusable materials, including: vinyl windows, kitchen cabinets, an electric fireplace insert, and other finish materials. Loading the truck is often the most difficult part of any salvage job. It can be like a combination of Tetris, Jenga, and Twister. However, the pieces are really heavy, have glass in them, and if they fall over, you lose much more than just the game. Rest assured, dear reader, that we did load everything safely and securely. We even piled on more at a quick Pick Up Service job in Duvall. The final tying-down used our last rope. If there’s a lesson to be learned here, perhaps it’s that things worth doing are often not easy, whether it’s salvaging reusable materials, saving you money on building supplies, or playing a game of Jenga.